To 7.5 KW, 230 Volts Single Phase & 230 Volts 3 Phase Range. 0.3 to 48 Nm Torque Ratings, Available with Low, Medium & High Inertia Type Motors. BCH servo motors are 3 phases’ synchronous motors. The Lexium 23C Series is compatible with 10,000 Increment encoder; Lexium 23M is compatible with 20 bit encoder, allowing the Lexium 23M to be used on applications requiring high performance for material working, for example machine tools etc. 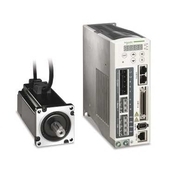 Lexium 23 is a Powerful Servo Drive, which can be used, either in standalone mode (with Digital I/O Control), or with External Position Controller. Three book-size servo drive models and two servo motor families plus a full range of intelligent options. Lexium 32 simplifies all aspects in the machine lifecycle from engineering to maintenance. A speed bandwidth of 1,600 Hz provides outstanding response. With a power density of 548 W/l Lexium 32 packs maximum power into minimum volume. This saves on cabinet space and size, reduces the machine footprint and decreases costs. Powerful integration software simplifies the entire process from planning to commissioning. The new Auto tuning function makes tuning easier than ever before. Lexium 32 offers a host of features for rapid installation and maintenance e. g. removable, colour-coded connectors. So Move software for configuring on PC and transferring the configuration via Bluetooth® or using a cable. Lexium 32 supports a wide selection of interfaces for fast integration into architectures. Communication boards, encoder options and accessories adapt your Lexium 32 solution. 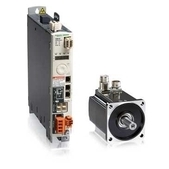 "Safe Torque Off" on board (IEC/EN 61800-5-2) for shorter downtimes and less wiring. The optional enhanced safety module eSM frees you from the hassle of devising complex, proprietary safety concepts. Access to SS1, SS2, SOS and SLS safety functions (IEC/EN 61800-5-2).